OK, we finally made it to Hawaii and I'm in love with the hawaiian quilts and want to make one. My question is, has anyone made one and quilted it on the machine? Or, is anyone planning to do this? It seems it would be faster than hand quilting even though it wouldn't be traditional. BTW, I saw tons of quilts that were mass produced, but were very pretty even though they weren't the traditional handmade ones. Loving it here, but will be glad to get home. I just completed the hand appliqué on a queen size quilt top. It's a gift for my DH. He asked me to please machine quilt it ,so he gets to use it before he " dies of old age". Guess I will. The quilt police never come around here anymore : they've been mortified too many times already! LOL! I don't see anything "wrong" about using modern methods to do a traditional quilt. Can't wait to see your results - Hawaiian quilts are on my to-do list too! I've done a lot of (cut work) applique- I love the technique and play with it often- I do machine stitch *use fusible* and machine quilt them- never had anyone complain- in fact our guild a few years ago had a workshop with someone who put out a whole book of (Hawaiian applique) designs- and she taught folding and tracing onto either freezer paper or fusible web & either needle turn or machine applique techniques. here's one that is all machine done. ckcowl that quilt is gorgeous! A lot of our ancestors hand quilted because they did not have a sewing machine. I've seen many Hawaiian applique quilts quilted by machine. Here's one I made from needle turned applique blocks - http://www.quiltingboard.com/picture...lt-t72844.html I quilted it on my Innova, one of my first longarming projects. ​Your machine quilted ripple quilting is awesome Dunster! 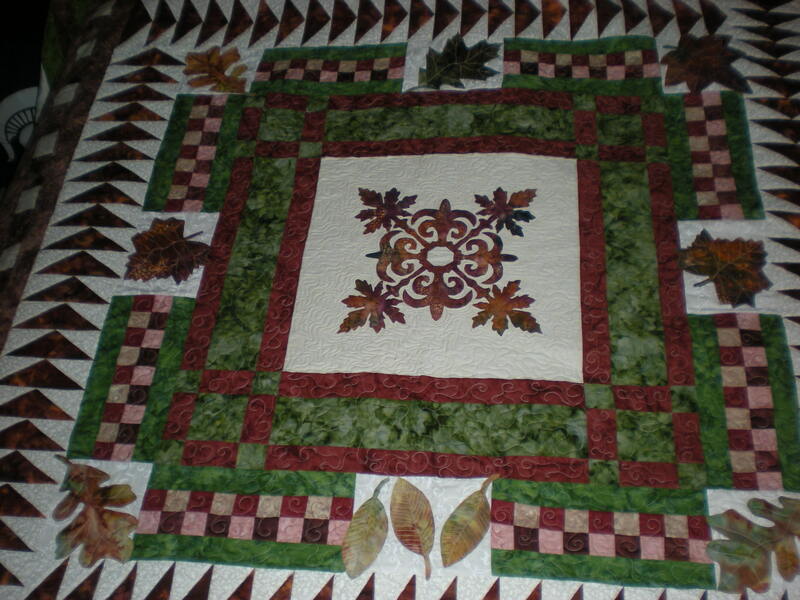 Some people think that as you have spent all the time needle turning the Hawaiian appliqué, you should hand quilt it. This is how beautiful tops become UFO's in my opinion. Quilt it however it will get done so you can use it. I would think you can do it however you want!!!! How big is your quilt? You may want to try to hand quilt it. Nancy Lee Chong of Pacific Rim Quilt Company had a terrific DVD out on how she hand quilts Hawaiian quilts: DVD: Hawaiian Quilting with Nancy Lee Chong. If you can you might want to give it a try. If you don't want the DVD t hen maybe your library could get it via interlibrary loan. I did it even with my hands but it wasn't a large quilt. Otherwise: your quilt, your quilting! Hawaiian "quilting" is usually echo quilting around the appliqued designs, right? I have seen, touched, admired and rejoiced over a (non Hawaiian) mid-1800s appliqued quilt (in a Fort Worth TX museum) that was MACHINE quilted in just this fashion. My goodness, if that amazing lady could machine quilt *her* handmade, appliqued, TRADITIONAL quilt, then so can we!!! If it is good enough for the pros, why no the rest of us? Stacy Michele has many videos showing her doing it all by machine and many are even quilt as you go. Do whatever is good for you and tell the quilt police to kindly move on down the road. It is your quilt and you are free to make it the way you want to make it. It will be beautiful however you make it. I took a class by Harriet Hargrave on using monofilament thread to machine applique. Wouldn't think of doing hand applique again. Results are fantastic and stitching is truly invisible. That is just beautiful. I love it. I have made several pillows using the Hawaiian appliqued patterns, I did the applique by hand and did the echo quilting by machine. Everyone really liked them. [QUOTE=Misty's Mom;---hawaiian quilts --- has anyone made one and quilted it on the machine? Or, is anyone planning to do this? I have one that after many starts and stops, running out of background fabric, trying substitute fabric to finish, finding the original fabric at Mary Jo's in Gastonia, ripping out substitute, etc, etc, have finally finished all the Machine Applique and it is ready to go on the longarm. Yea! (Soon as I decide how to quilt it. I want something more than echo.) Doors are locked so quilt police cannot get at me! It is your quilt and if anyone complains that you did it by machine tell them to get some fabric and a pattern and they can do it what ever way they want. If it is the quilt police ask them to mind their own business and ask them to leave and not come back. I swear I will not send the quilt police. Even our grandmothers would use a sewing machine to piece and quilt their quilts. No quilt police there.